SSD Storage Technology Acting without any moving parts, the Intel X25-M Mainstream solid state disk (SSD) boasts multiple advanced features including zero mechanical noise, faster data rates compared to conventional HDDs, over 1.2-million-hour life span, ultra-low power consumption and impressive shock, vibration and extreme temperature resistance. With these breakthrough capabilities, the SSD meets all the demanding requirements for high-performance data storage. 2.5" Form Factor The Intel 80GB solid state disk is specifically designed for notebook computers equipped with a 2.5" SATA II drive bay. 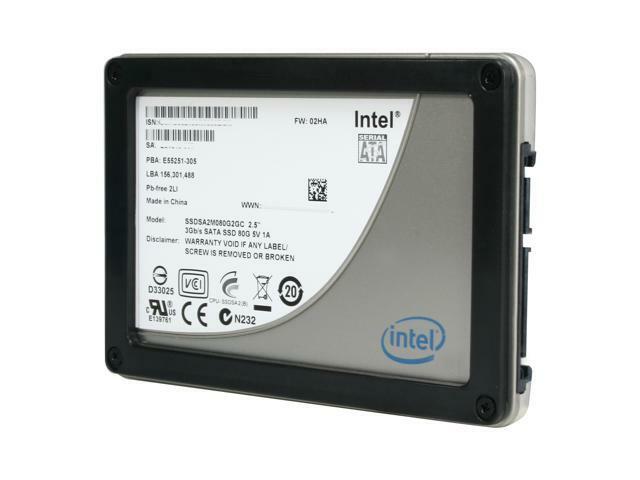 SATA 3.0 Gb/s Interface The Intel 80GB solid state disk features the next-generation SATA II interface supporting up to 3.0 Gb/s data transfer rates, Native Command Queuing (NCQ) and hot-pluggable point-to-point connections for optimum performance, efficiency, convenience and flexibility. "The Best SSD" Award from DRAMeXchange The Intel X25-M Mainstream series SSD get "the Best SSD" Award Insignia from DRAMeXchange. Pros: 2 of these 80GB SSDs are still going strong in RAID-0 after 10 yrs of heavy use! Lots of gaming and lots of adding and deleting off these drives as you could imagine being only 148GB after installed. I have not even redone my OS since I installed these on them 10 yrs ago. I cannot say enough about Intel and these drives. I upgraded my laptop to 2 Intel SSDs because of my experience with these drives. Cons: Price to GB ration! I was watching for these and bought them as soon as they came out. For 2 of them I paid a stiff price. That to me is still insane to this day but I had the money and wanted the best. I definitely was not let down. Other Thoughts: After using 2 of these in RAID-0 for the last 10 yrs with heavy gaming I have to say I still love them and they are still in this desktop I built back then. I still have them in RAID-0 and never had even a single hiccup. Sure I only have 160GB (2x80 which installed to 148GB) as the main system setup which I also keep 2-4 games installed but I still have no reason to change my desktop configuration as it pretty much maxed out. Don't get me wrong, I have a $3200.00 laptop also with faster and larger SSDs in a RAID-0 but I can say, this desktop is still gaming in 2018 with at least many of the great older games. Originally I was going to use one as boot and one as a storage. I did that for about 2 months. Everything told me to try them in RAID-0 so I did and I can tell you there was a very noticeable increase even from the insane speed I was already experiencing with a single SSD for the first time. I will always put SSDs in a RAID-0 configuration as long as there is not a bottleneck. I’ve already looked into M.2 drives in RAID-0 on a new build and cannot wait until we just click a button and your OS, game or whatever you are doing is instant. Other Thoughts: Used this drive for 3 years, then set aside for 3, just put it into a laptop and still working great with no issues. Comments: Bought this to be the boot drive in my Macbook Pro. It's been great so far, the laptop boots up and shuts down even faster than it did before. I removed the optical drive to make room for this and am using the existing 500GB drive for data. Pros: Got this as an upgrade for my laptop. Noticed an immediate performance increase, as well as slightly longer battery life. Switching from a HDD to an SSD is one of the most dramatic upgrades out there. Cons: Price compared to that of hard drives. Pros: Fast!!! Boots 64bit win7 in seconds. Programs load and install very quickly including those .NET updates that used to take a 1/2 hr. to install. Does not come w/ a 3.5 to 2.5 adapter. No prob as there are no moving parts and it's in a stationary system. I just let it sit inside the case for now. Pros: Super fast drive, im running an i7 860 with only 4GB of DDR3 dual channel. Cold boot is about 35seconds on Win7 64x and reboot in less than a minute. Screaming fast while installing apps and running them as well. Other Thoughts: Highly recommended for someone building a system to buy this drive as their primary OS drive. Pros: when i built my computer last year the only thing i didn't do was purchase a SSD drive for my system partition. this drive has completed my hopes for this rig. OS loads quickly, and Windows 7 automatically made all necessary changes to the way in which it operates. Cons: I always need more drive space.